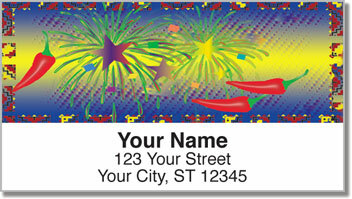 This festive set of return address labels lets you put a spicy celebration on every envelope! Colorful fireworks and stars combine with the popular chili pepper motif to create a red-hot design that bursts with excitement! An Aztec print makes up the border giving your labels some extra southwestern style. 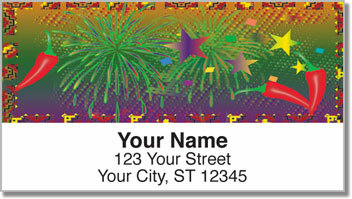 Southwestern Celebration Address Labels from Check Advantage are a ton of fun, but they're also extremely useful. Stick them on all your letters and packages and never scribble out your name and address by hand ever again! 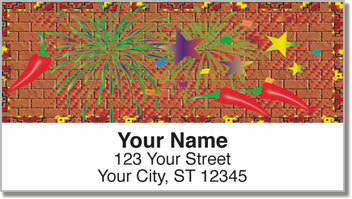 You can also use this vibrant selection to mark all sorts of personal property. 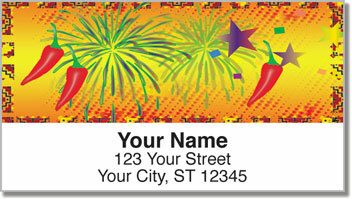 Get your own Southwestern Celebration Address Labels now! And don't forget to take a look at the matching personal checks!